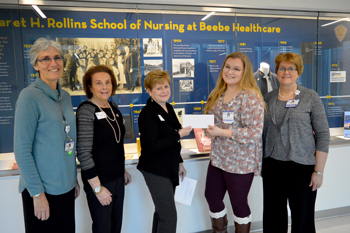 The Zwaanendael Club of the General Federation of Women’s Club (GFWC) sponsors a scholarship annually for a nursing student who has achieved academic excellence in their first semester at the Margaret H. Rollins School of Nursing at Beebe Healthcare. This year’s recipient of the Zwaanendael Club scholarship is Megan Kelly of Bear, Del. Megan is a graduate of Appoquinimink High School. She currently lives in Georgetown and plans to continue her education after nursing school at University of Delaware where she hopes to earn her bachelor’s degree in nursing. Shown (left to right) are: Diane Barlow, Beebe Medical Foundation; Terry Yates, President, Zwaanendael Women’s Club; Sue Olkowski, Vice-President, Zwaanendael Women’s Club; Megan Kelly, recipient; and Tracy Bell, Program Coordinator, Margaret H. Rollins School of Nursing. The Margaret H. Rollins School of Nursing at Beebe Healthcare is the only hospital-based nursing program in Delaware and is accredited by The Accreditation Commission for Education in Nursing (ACEN). The diploma in Professional Nursing is awarded at the completion of the curriculum, qualifying graduates to be eligible for National Council of State Boards of Nursing NCLEX examination, leading to licensure as a registered nurse. Beebe graduates consistently have high NCLEX pass rates. For more information on the School of Nursing, go to www.beebehealthcare.org/school-nursing.